A former President of South Africa Jacob Zuma on Friday lodged a court application to try to have quashed $2.5-billion corruption case linked to a 1990s arms deal, state prosecutors said. 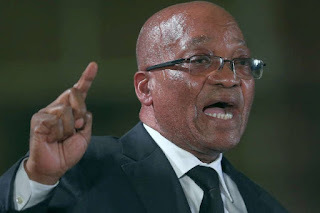 CKN News gathers that the former South African President has been charged with 16 counts of fraud, racketeering and money laundering relating to the arms deal dating back to before he took office in 2009.
told AFP that Zuma’s lawyers filed papers at the High Court in Durban requesting a “permanent stay of prosecution”. “I can confirm that (the application has been filed),” she said on the phone. The former 76-year-old President is due back in court for a hearing on November 30. Zuma is accused of taking bribes from French defence company Thales during his time as a provincial economy minister and later as deputy president of the ruling ANC party. The former ANC leader allegedly pocketed around four million rands ($340,000, 280,000 euros) from 783 payments handled by Schabir Shaik, a businessman who acted as his financial adviser. On Thursday, Thales announced in a statement that it had also filed its own court application to have the prosecution dropped. The French defence company argues that the re-introduction of the charges “holds no validity” because the charges were originally struck down in 2009. A separate judicial enquiry into alleged state corruption during Zuma’s time as president is currently hearing evidence in Johannesburg.